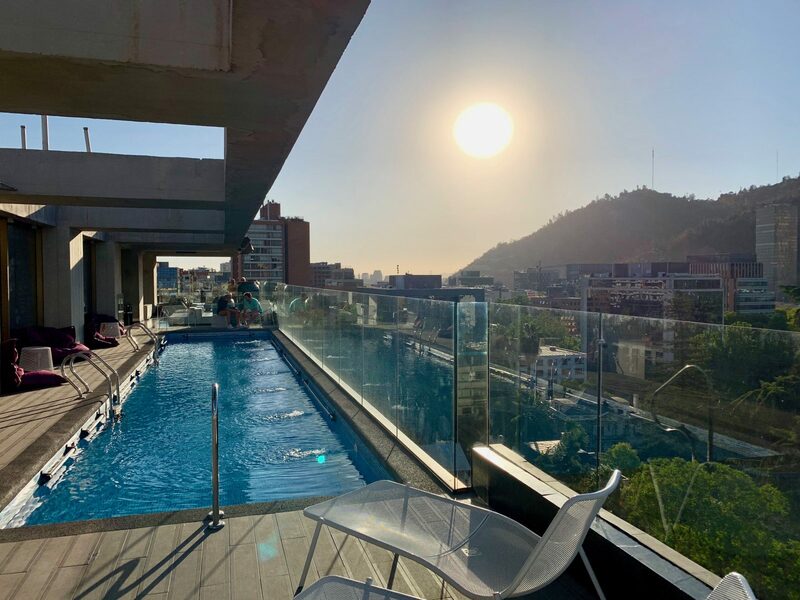 When we were looking for where to stay in Santiago, Chile, we spent a long time looking at places and budgets. You can go very international and luxury in Santiago but you tend to be further away from the centre. You can also find a lot of high-priced luxury boutique hotels dotted around the city closer to the attractions. We almost booked into one of these as we figured we would probably never go to Santiago again, but then last minute we found Hotel Solace – the perfect mix of location and amenities – at a much better price. I really liked the rooms in Hotel Solace. We stayed in 2 of their “suites” (basically executive rooms – the dining area is a table at the side of the room.) during our time in Santiago sandwiched around our hiking trip and both were identical – one on the 4th floor and another on the 10th. They were big with 2 bathrooms – one was a shower room and the other a toilet and sink. It was nice to have the separation. The floor to ceiling windows were great for letting light into the room. We were facing an office block, but the blinds were good and we often weren’t in the room when people were in the offices so it wasn’t an issue. The curtains were also heavy and really blocked out the light when needed. We are quite used to sleeping with our blinds open as we are not overlooked in our current home, so we don’t require darkness to sleep, but this is definitely a great feature. The bed was huge and really comfortable and had great features like reading lights and plugs near your head. I was really pleased to see a good coffee machine – but no peppermint tea. We had a lot of supplies with us for our hiking trip, so that wasn’t a big issue. Hot water came out of the coffee machine for tea. There is a good safe in every room and a wardrobe with hangers, as well as a mini bar filled with complementary soft drinks. The TV had a mix of channels – many in English and other international languages. Service was great. The rooms were always really clean and well maintained. We often got a knock on the door to just be given some hotel chocolates. At the reception they were really helpful in regards to organising legitimate taxis for us, finding us a UK adaptor and answering any questions we had. They spoke excellent English, as well as allowing me to speak Spanish when I did. The gym on the rooftop is simple with a couple of cardio machines – but one hell of a view. It is next to the rooftop pool area & bar. As the weather was pretty hot, it was a good place to get in some cardio if going for a run was off the cards in the heat. The pool however was a stunning place to hang out. 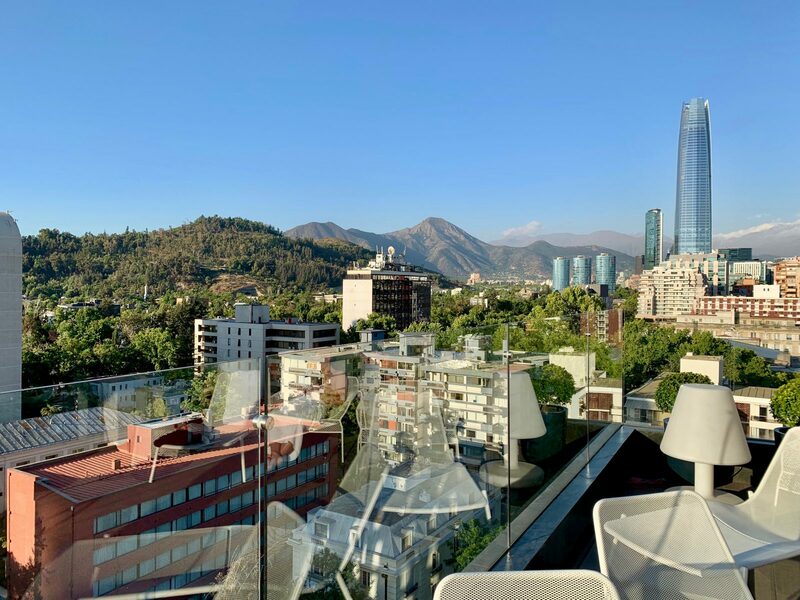 And the rooftop bar had views for miles around the city and the Andes mountains. There are a couple of restaurants in the hotel. We did have breakfast each morning and it was a good mix of items with good coffee and healthy options. We didn’t try the other one – it didn’t have good reviews on TripAdvisor and we wanted to hit up other places on the list. Read my 5 Places to Eat in Santiago for some tips. There is great coffee bar in the lobby area too, where people would often have quick meeting and a catch up. The Hotel Solace is in the Providencia province, It’s a great location where you will find a lot of offices, shops & restaurants. 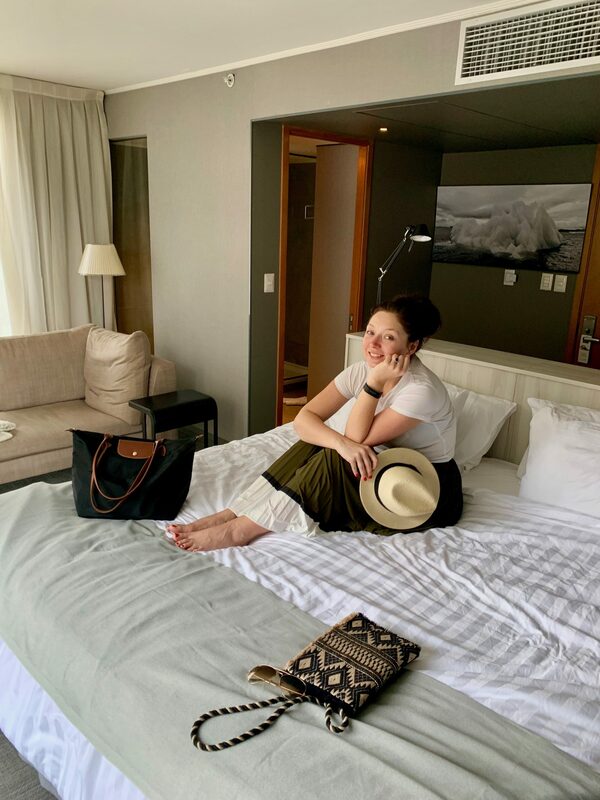 We found a lot of great places to eat in the area and the Costanera Centre, which is a huge mall with a big Jumbo supermarket and many international chain stores. It is also right next to the metro. 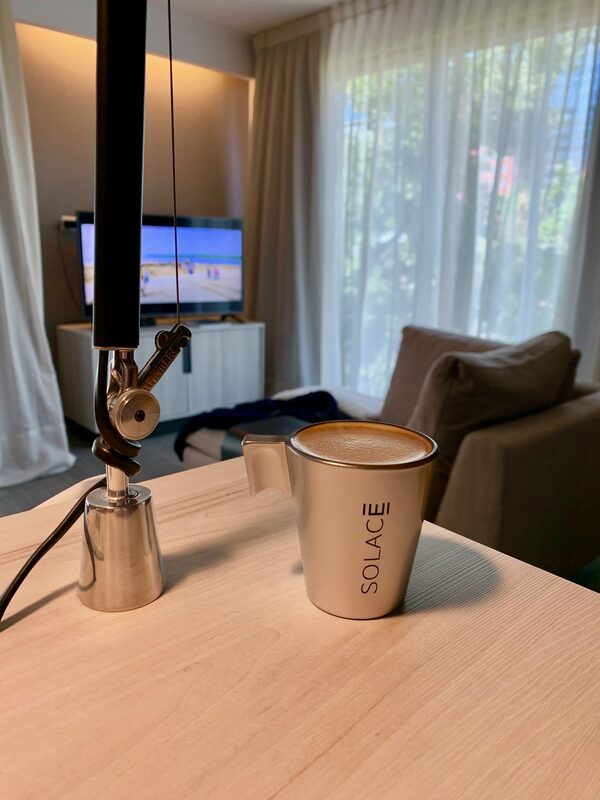 I’d definitely recommend the Hotel Solace – it is really well priced and the inside is modern and clean and the service is excellent. The rooftop views are fantastic and the free drinks in the mini bar are a nice touch. I’d very much recommend upgrading your room too! We paid £120 per night in December 2018 for a suite.